iPhone XS set for 12th September launch | What Hi-Fi? Apple has sent out invitations for its annual September iPhone launch event, confirming the hotly-tipped date as Wednesday 12th September. We are still expecting to see three new iPhones, and now 9to5Mac has uncovered what it thinks is proof that two of the new iPhones will be called the iPhone XS. To recap, the smart money says Apple will launch three new iPhones at the 2018 Apple event, just as it did last year. We're expecting to see two stainless steel upgrades to the iPhone X, in two different sizes and each with an OLED screen. And it's these two models that look set to be called iPhone XS. (And not iPhone 11, iPhone X2, iPhone XI...) The third iPhone will be a more affordable, aluminium take on the iPhone X and is likely to sport an LCD screen. 9to5Mac says the image above isn't a render or photoshopped picture but a genuine leaked image from Apple's forthcoming marketing for what will be known as the iPhone XS. And it certainly looks like a believable Apple image, thanks to the familiar angle of the shot and the stylised image on the screen. 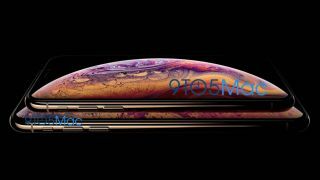 The site believes the iPhone XS will come in 5.8in and 6.5in OLED screen sizes and be available in a new gold finish. And the gold colour would certainly match the shade used in Apple's invitation to the event (above).